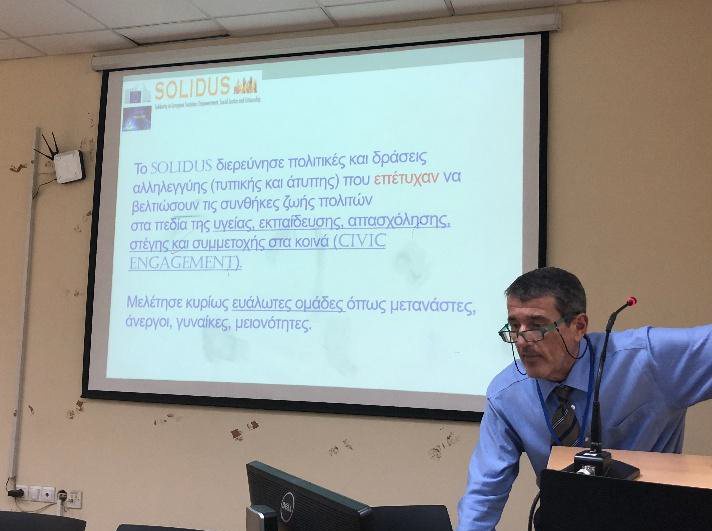 The Greek research team participating in the SOLIDUS project held its national seminar on Friday 1 June in the Amphitheatre of the Department of Social and Education Policy at the University of the Peloponnese in Corinth. 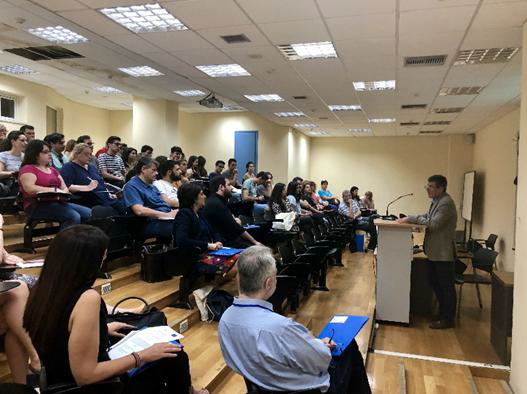 The aim of the seminar was to disseminate the research outcomes of SOLIDUS and to focus on the similarities of solidarisation during the Greek crisis with the European solidarity context. It also sought to advance interdisciplinary and multi-subject thinking around the contested meaning of solidarity. Those invited to the seminar included academics, researchers, experts, policymakers, representatives of independent authorities and the representatives of local social organizations (Region of Peloponnese, Municipality of Corinth, NGOs and civil society organizations). The event was attended by almost a hundred participants. The seminar began with an overview of SOLIDUS. 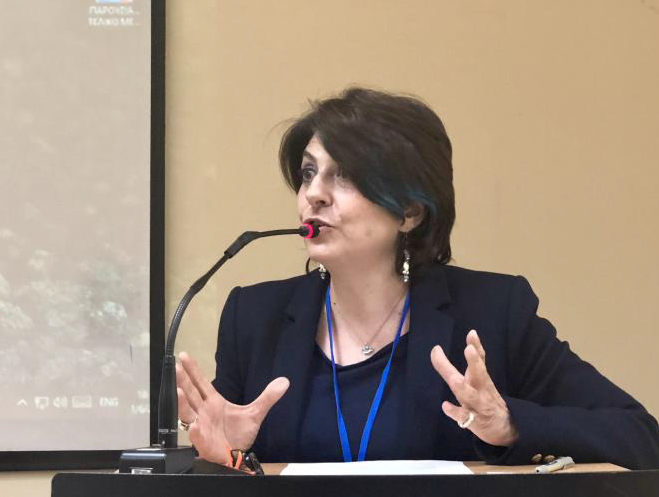 The main goals of the project, the topics of the work packages, participant countries and universities, funding, fields of research and basic methodological tools used were presented. Next, an analysis of the overall research results of SOLIDUS took place. The main findings and good practices were mentioned, as were ways in which to apply them to the situation in Greece and other countries. This was followed by a presentation of the Greek findings and an attempt to correlate them with the general conclusions of the project. Subsequently, the discussion focused on the roles of official and unofficial modes of solidarity in Greece during the economic crisis and the relevant cooperation emerged including civil society, local authorities, third sector, NGOs, etc. The discussion of SOLIDUS results was followed by presentations of the solidarity actions taken through various mainly bottom-up social initiatives and cooperative activities. Emphasis was given to developments in the fields of social insurance, education and housing. The first presentation provided a panoramic commentary on formal and informal solidarity in Greece during the economic crisis. It was noted that the effects of the consequent social crisis led to a partial mobilisation of civil society. The signs of civil mobilization and engagement during the crisis are an encouraging but still fragile social development. The exacerbation of social deprivation due to the crisis in combination with significant cuts to social expenditure provided huge social policy gaps and obliged smaller and larger groups of Greek people to become more active and undertake social initiatives. This could be seen in the increased importance of the role of NGOs and local movements in dealing with acute social problems. In addition, politically-oriented collectives undertook informal initiatives in an attempt to rally citizens to their side. Pension spending suffered the severest of cuts due to the austerity measures. A system of social insurance with huge deficits and high spending had developed in Greece, which had long ago become unsustainable. In the past decade a weakening of social insurance systems that strengthen intergenerational solidarity, such as pay-as-you-go pensions, has been increasingly observed. Systems with an individualised philosophy, such as funded pensions, have been gaining ground and this appears to be the case in the new Greek contributory pension system. Education is another area in which both formal and informal solidarity actions have flourished. The growing humanitarian needs during the crisis embraced also incidents of malnourished school pupils. This has led to the introduction of school meals in many schools around the country. Alongside this, most poor households are unable to pay for private lessons and crammer schools for their children. For this reason, several collectives of employed and unemployed teachers with the cooperation of local authorities have arranged crammer schools to provide extra tuition. This focused mainly upon working-class children applying to university and whose families cannot afford to pay for this support. During the Greek crisis, access to housing for vulnerable groups was limited. A double negative trend unfolded: housing costs for poor households rose while, at the same time, the meagre housing benefits fell even further. The phenomenon of the neo-homeless has also emerged during the crisis years, prompting civil society and many volunteers to react to the inadequate state services on offer. Housing movements grew in Greece. The movements against foreclosures on primary residences, arguments in favour of collective housing, as well as the occupation of buildings in order to house refugees were the most powerful manifestations of the fight for the right to housing. The seminar came to a close with a case study. A representative from the Municipality of Corinth gave a presentation on the solidarity actions that are currently being undertaken in Corinth. A series of partnerships with local society collectives seeks to manage the increased social inequalities, in particular, to reduce poverty and social exclusion and to support families in need. Partnerships with NGOs, the Church, citizen initiatives and even private companies in the region have been formed within the Municipality, in order to secure the greatest possible concentration of strengths. Solidarity actions such as soup kitchens, hostels, social crammer schools, creative activities for children, English and Greek classes for refugees and psychosocial support services are being offered through these partnerships. At the end of the day, the audience found the seminar especially interesting. This stimulated an in-depth discussion on the ways in which the practices of solidarity presented could offer effective and long-standing solutions to combat social inequalities, enforce a more collective culture embracing societal values and reinforce civic engagement and inclusive social cohesion.